The Javasche Bank was founded in 1828 and continued its operations until after the Dutch transfer of souvereignty to Indonesia in 1949. 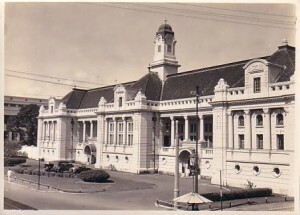 The Javasche Bank became the circulation bank for the Republic of Indonesia and was nationalized in 1953. A date in italics (24/01/1828) means the date of the decree deciding about the appointment or discharge of the board member. The date of a decree is only mentioned in case the actual start or end date is unknown. Leonard Pierre Joseph viscount du Bus de Gisignies, Commissioner General of the Netherlands Indies, appointed Chr. de Haan by decree 25 on January 24, 1828, to the position of President of the Javasche Bank. Although several other people applied for the position of President, the Commissioner General used his right to move past the nominees. On December 13, 1837, after almost 10 year of service, de Haan was granted a two year European leave. He seceded in the board meeting of March 22, 1838. C.J. Smulders, the Secretary of the Javasche Bank, succeeded de Haan as President by decision of the Commissioner General on March 31, 1838. In November 1846, Smulders bought 1/2 share in the sugar factory Langsee. On January 7, 1851, Smulders requested to be honorably discharged because of his weakening health. By decree of March 4, 1851, Smulders was honorably discharged. He decided to dedicate his time to his interest in the Langsee sugar factory. His successor E. Francis, took over presidency during the board meeting of March 10, 1851. Emanuel Francis started his career in the Netherlands Indies as a clerk in 1815 and worked his way up in the government service to eventually become the top civil servant available to the Commissioner General. From 1848 to 1850 Francis was Inspector of Finance and in 1851 he was honorably discharged from the governement service. Next, Francis was appointed to President of the Javasche Bank by decree of March 4, 1851. On his own request Francis was honorably discharged per Juli 1, 1863 per decree of April 20, 1863. In 1864 Francis published a book “De regerings-beginselen van Nederlandsch Indië: getoetst aan de behoefte van moederland en kolonie”, expressing his dissatisfaction with the implementation of a new economic system in the Netherlands Indies and proposing an investigation by an independent committee. In 1969 Francis published a request to the Dutch parliament about his reputed right for payment of pension being a retired civil servant of the Netherlands Indies government. Wiggers van Kerchem was appointed President per July 1, 1863. Wiggers van Kerchem was a member of the firm Tiedeman & van Kerchem in Batavia prior to his appointment. Per decree of June 30, 1868, it was decided to discharge Wiggers van Kerchem in the most honorable way. After finishing the concept of the fifth Exclusive Right that should be implemented per April 1, 1870, Wiggers van Kerchem decided to return to Europe for retirement. Wiggers van Kerchem was succeeded by Diepenheim by decree of June 30, 1868. Diepenheim who proviously was Secretary for two years, was President for a short period. He resigned shortly after the fifth Exclusive Right was made public. On March 18, 1870, his resignation was accepted. Diepenheim died in The Hague on May 21, 1875 in the age of 75. By decree of March 19, 1870, Alting Mees was appointed to the position of President of the Javasche Bank. Alting Mees, previously lawyer and attorney, already served the bank as director for several years. Due to his appointment to President of the two high courts of the Netherlands Indies, he left the Javasche Bank per March 31, 1873. Norbertus Petrus van den Berg was chosen as the next President of the Javasche bank from two nominees and was appointed per decree of March 20, 1873. After more than 16 years of service, Van den Berg left the Netherlands Indies in 1889 to become Director of the Nederlandsche Bank and two years later President for a period of 21 years until the age of 81. He passed away in Amsterdam on January 8, 1917. Altough the board recommended Buijskes to become the next President, the Governor General appointed S. B .Zeverijn to that position by decree of August 21, 1889. Zeverijn was forced because of illness to leave for Europe on March 1, 1893 where he died on December 13, 1893. Groeneveld, serving as Director zince 1877, was promoted to President of the Bank per decree of September 29, 1893. After more than five years as President, Groeneveld died on December 21, 1898. Groeneveld was the first President that came from the Bank’s own personnel. Reijsenbach was President of the Javasche Bank from March 25, 1899. After the Eight Exclusive Right was established, Reijsenbach resigned and was honorably discharged per February 28, 1906. Reijsenbach died on December 1, 1918. 1912.31/10/1912 – 01/07/1924 E.A. Zeilinga Azn. Trip was appointed to the position of Director in the first half of 1924 and promoted to President of the Bank per July 1, 1924. He stepped down on July 1, 1929. Later, Trip was President of the Nederlandsche Bank during two periods, form October 12, 1931 to March 19, 1941 and from May 1945 to May 1, 1946. He died in The Hague on March 5, 1947. Gerard Gilles van Buttingha Wichers was keeper of the records (Chef der Secretarie) at the Nederlandsche Bank from 1919 to 1928. He was was appointed President of the Javasche Bank in the course of 1929 and held the position until he died from a hearth attack on November 17, 1945. During the Japanese occupation of the Netherlands Indies he was kept prisoner in a war camp by the Japanese. His signature appeared for the first time on banknote (25 Gulden) on August 1, 1929. After Van Buttingha Wichers passed away and R.E. Smits was not in Indonesia, the Lieutenant Governor General used his special mandate to appoint J.C. van Waveren to acting President of the Javasche Bank on February 28, 1946. Van Waveren resigned for health reasons in September 1946. Smits was appointed acting President of the Javasche Bank on November 10, 1946 by decree of the Lieutenant Governor General. Smits died unexpectedly on September 13, 1949. Although Count J.H.O. van den Bossh was a serious candidate to succeed Smits, his nomination was dropped because of his name since he was the great-grandchild of the governor-General Van den Bosch who introduced the contoversial Cultivation System in the Netherlands Indies in the 1930’s. In stead Houwink was appointed as President on October 29, 1949. Houwink had to read in the newspaper on April 30, 1951 that the Indonesian government decided to nationalize the Javasche Bank and shortly after heresigned from his position as President. After his resignation he continued to be an advisor to the Javasche Bank management for some time. Sjafruddin Prawiranegara, born on February 28, 1911 in Banten on island of Java, was appointed as the first Indonesian President of the Javasche Bank in the course of 1951. Prawiranegara remained President until the Javasche bank was continued as Bank Indonesia on July 1, 1953. Prawiranegara was releasedfrom his post with immidiate effect at the end of January 1958 by Indonesia’s President Soekarno himself because of his involvement in the rebellious PRRI (Pemerintah Revolusioner Republik Indonesia) movement in Sumatra. He was replaced by Loekman Hakim who held the position for only one and a half years. Prawiranegara was imprisoned from 1961 to 1966 due to his PRRI involvement. He died of a heart attack on February 15, 1989. Du Bus appointed C. J. Smulders by decree 25 on January 24, 1828, to the position of Secretary of the Javasche Bank. Out of four people that applied for the position of Secretary, Smulders was nominated together with J.R. Turing who became accountant and treasurer at the Javasche Bank. 31/03/1838 – 18/11/1840 H. Roos Jr.
Roos Jr., accountant and starting April 1, 1935 also treasurer, was appointed to the position of Secretary by decision of the Commissioner General on March 31, 1838. Roos Jr. was honorably discharged by decree of November 18, 1840 because he joined the firm Reijnst& Vinju in Batavia. Meder, managing clerk of the firm Nolthenius & Co. in Batavia was appointed Secretary of the Javasche Bank through the same decree that discharged Roos Jr. After less than three years after his appointment, Meder died on October 19, 1843. By decree of December 27, 1843, Willer was appointed to the position of Secretary of the Javasche Bank. Willer left the bank on May 15, 1849 in order to join the firm Reijnst& Vinju in Batavia. Lingeman, who already served the bank for twelve years, succeeded Willer by decree of June 10, 1849. After five years as Secretary, Lingeman died in June 1854. Rochussen, a lawyer and attorney, was appointed Secretary of the Javasche Bank by decree of May 8, 1860. Rochussen resigned in the course of 1862. Hoeven, already employed by the bank as treasurer since 1857, took up the position as Secretary by decree of November 17, 1862. Due to his weak health, Hoeven changed his position to become agent at the Semarang branch, however shortly thereafter he went to Europe for leave. Only after a couple of years he resumed his work in Semarang. Hoeven was given an honorable discharge by decree of May 14,1866. Diepenheim was appointed Secretary to the Javasche Bank per decree of May 14, 1866. On July 1, 1868, Diepenheim succeeded Wiggers van Kerchem as President of the Javasche Bank. When Diepenheim was promoted to President, Schuurman was appointed as Secretary in 1868. On April 1, 1870, as part of the new Fifth Exclusive Right, Schuurman continued his employment in the capacity of director for several more years until he resigned per April 1, 1876..
By decree of March 24, 1870, D.N. Versteegh was appointed as director of the Javasche Bank. Versteegh was a former agent at the Soerabaja branch of the Javasche Bank. Versteegh resigned per September 1, 1877. Buijskes was appointed to Director of the Javasche Bank per decree of July 26, 1876 and actually started per August 1 of the same year.Buijskes was honorably discharged per June 18, 1892. It is mentioned in the “Gedenkboek van de Javasche Bank”, that Groeneveld was appointed as Director of the Javasche Bank per decree of August 22, 1876, and started his mandate on November 26 of the same year. Hoever, the author assumes the year has been wrongly printed and should be 1877, since Groeneveld succeeded Versteegh, who left the Bank on August 1, 1877. Groeneveld, previously agent of the Soerabaya branch of the Javasche Bank, served as Director for many years and was promoted to President of the Bank per decree of September 29, 1893. Appelius van Hoboken, previously an agent of the Soerabaya branch of the Javasche Bank was appointed to Director by decree of May 21, 1892. After less than a year being Director, Appelius van Hoboken died on March 19, 1893. By decree of March 27, 1893, Hepp, previously agent at the Soerabaya branch, was appointed as Director of the Javasche Bank. When Hepp’s term expired on July 6, 1898, he withdrew from being re-appointed. H.P.J. van den Berg, brother of the past President of the JavascheBank N.P. van den Berg, was appointed to the position of Director by decree of October 12, 1893. H.P.J. van den Berg was appointed as President Groeneveld’s successor on January 17, 1899, but died on February 9, 1899 in Nice, before actually starting his new position. Per decree of June 15, 1898, Reijsenbach was appointed as Director. He actually started in this position on August 23, 1898. Shortly after and due to the death of H.P.J. van den Berg, Reijsenbach was promoted to President of the Javasche Bank by decree of February11, 1899, which he actually started per March 25, 1899. Meertens, previously Notary in Batavia, was appointed to the position of Director by decree of April 25, 1899. Meertens only stayed a short while in his position. He requested European leave on December 27, 1901. Later, his return to the Netherlands Indies was discouraged by his doctors and he decided to resign from his position as Director on May 1, 1902. Jan Frederik Hendrik de Vignon Vandevelde, born in Geertruidenberg, the Netherlands on December 19, 1859, was appointed to the position of Director per decree of February 11, 1899. He died on March 7, 1931 in The Hague. By decree of April 25, 1902, Van Suchtelen was appointed as Director of the Javasche Bank. Prior to that, Van Suchtelen was agent at the Semarang branch of the Bank. 17/04/1907 – 31/10/1912 E.A. Zeilinga Azn. Zeilinga started his position as Director of theJAvasche Bank on April 17, 1907. When Vissering resigned as President in 1912, Zeilinga succeeded him per October 31 of the same year. Gerritzen, born in Soerabaya in 1869, started as Director of the Javasche Bank on April 1, 1908. Prior to this Gerritzen was a lawyer at the High Court in Batavia. He held the position of Director for more than 12 years until it ended at July 1, 1920. After that Gerritzen returned to the Netherlands adn was a member of the Dutch parliament from 1922 to 1925. In 1926 Gerrtizen published “De Welvaart van Indië” containing the text of a number of his speeches about the economy of the Netherlands Indies. He died on December 10, 1941 in The Hague. When Zeilinga was appointed to President, K.F. van den Berg, the son of the previous President of the Javasche Bank, N.P. van den Berg, filled up the vacancy of Director at the end of 1912. Prior to this K.F. van den Berg served as the treasurer of “De Commissie voor den Nederlandsch-Zuid-Afrikaanschen Handel”. Hendrik Jan Manschot, born on May 5, 1907, On February 28, 1946 the Lieutenant Governor General used his special mandate to appoint H.J. Manschot to Managing Director. In the course of 1947 Manschot became the Director of the Amsterdam branch of the Javasche Bank. He held that position up to the nationalisation of the Bank by Indonesia. Teunissen was appointed Managing Director of the Javasche Bank by decree of November 10, 1946 by the Lieutenant Governor General. He resigned on June 30, 1953 and was the last Dutch Director of the Javasche Bank that was renamed the next day to Bank Indonesia. Paul Spies, born in Rotterdam in 1904, was Director and Second Vice President of the Javasche Bank from 1949 to 1951. In November 1950, almost a year after the official transfer of souvereignty to Indonesia, Spies was arrested and kept in police custody for four days for unclear reasons. He was only released after cabinet member Sultan Hamengku Buwono IX of Yogyakarta intervened. In September 1952 Spies resigned as Director, however remained to be an advisor in the background. During and after his employment at the Javasche Bank, Spies travelled a lot within the Netherlands Indies (primarily to Bali) and later throughout Asia. He became a recognized photographer. During a trip to Laos, where he stayed in disguise as a photographer, he was killed in the civil war on February 5, 1963. He was burried in Laos with American military honor. In 1942 Smits is Managing Director of the Javasche Bank and involved in the ordering of couterfeit Japanese invasion money in Australia. By decree of October 10, 1946 Smits was appointed as President of the Javasche Bank. Indra Kasoema was added as a Director to the three head board of the Javasche Bank in 1950. He is reported to still assist Loekman Hakim in 1959 as Director at Bank Indonesia and mentioned as Acting Governor of that Bank in 1960. Hakim was added as a Director to the three head board of the Javasche Bank in 1950. He was promoted to Governor of Bank Indonesia in January 1958 when previous Governor Prawiranegara was fired. 1. Why was the 5 gulden proof note of 1942 signed by Praasterink & Wichers? 2. Who is “Van Duyn” who is mentioned as signatory on banknotes of the Javasche Bank by KUKI, Mevius and Java Auctions? 3. Why are the SPECIMEN banknotes of 300 gulden Mercurius signed by Vandevelde as President?